Good morning! Emily Midgett here from Sixth Street Sundries, back today for a guest post for Wplus9! For today’s post, I wanted to show how you can get a little extra mileage from your coloring supplies. I recently made the mistake of selling off a good chunk of my Copic collection (silly, I know), so I’ve been doing some improvisation in order to achieve my shading goals until I can get my collection built back up. 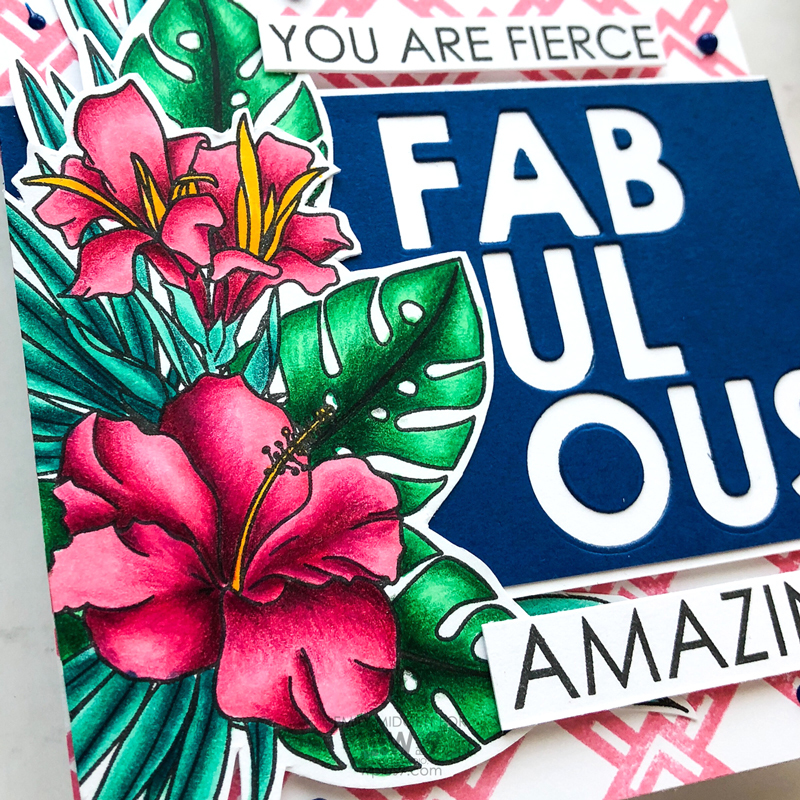 For today’s post, I combine my somewhat limited Copic collection with my full Polychromos collection to create dramatic contrast, shading and depth on the gorgeous Hibiscus Bouquet stamp set. The technique demonstrated in the video uses Copics as a base layer for my Polychromos pencil shading. You can use this technique whether you have just a few Copics or an abundance… it really is great for stretching your supplies. I start by stamping the Hibiscus Bouquet on some white card stock with Copic-friendly black ink, then coloring the image with Copic markers to lay down that base layer of bright color. After the Copic coloring was completed, it was time to go back in and add layers of color using my Polychromos pencils. (You could absolutely achieve similar results with Prismacolor pencils.) Because these pencils require many layers of color to achieve a smooth, saturated finished product, adding that first layer of Copic coloring really helps cut down on the amount of time spent coloring. Another bonus: the super sharp points of the colored pencils allow you to get in every nook and cranny on a more intricate image like the Hibiscus Bouquet. 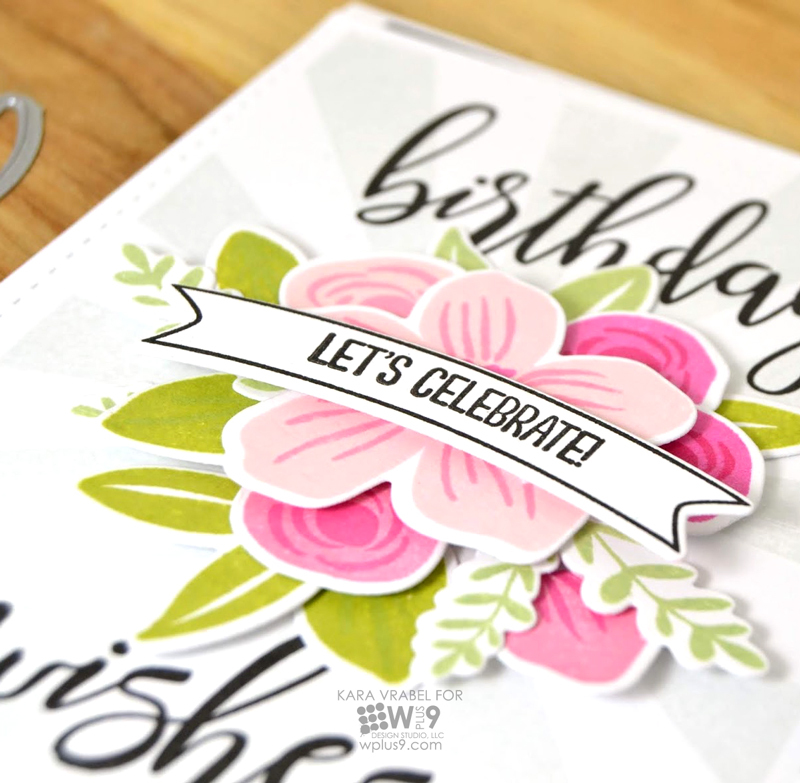 After I had finished coloring the gorgeous Hibiscus Bouquet image, I fussy cut it with some very sharp scissors, then turned my attention to the card base. 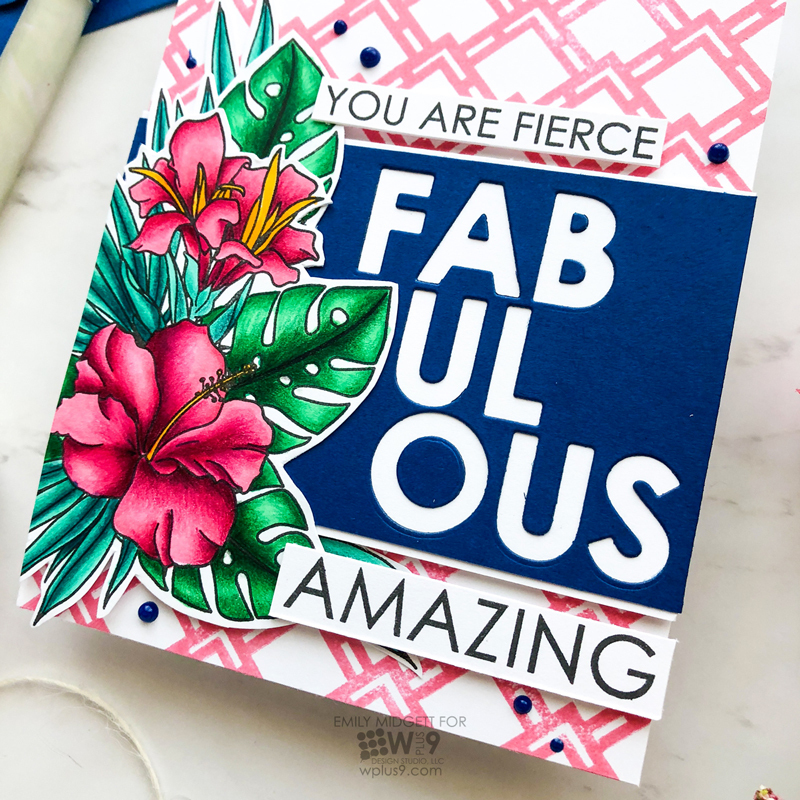 I used Wplus9’s Little Piggy ink to stamp that fantastic geometric background from Tropic Fever onto a white card base. 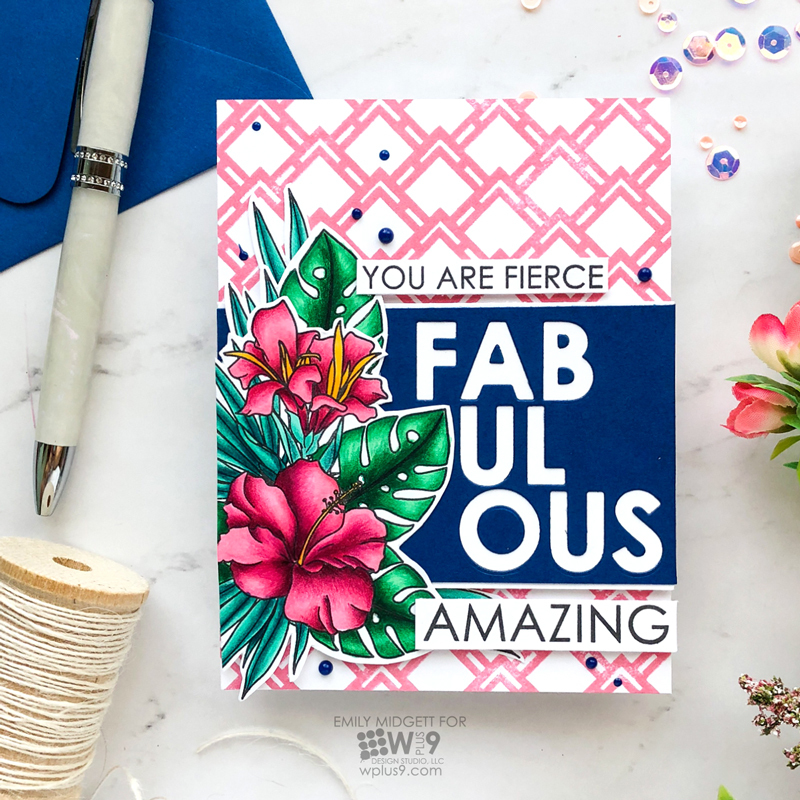 I then used the Fierce and Fabulous stamp and die set to create the greeting, using the negative portion cut from navy blue card stock for a fresh, preppy color combination of pink, white, and navy. The hibiscus flowers with that bold geometric design reminds me of Lilly Pulitzer! After I’d adhered everything to the card base with foam adhesive, some of the foliage from the Hibiscus Bouquet was still hanging over the edge a bit, so I trimmed it off and added it to the bouquet. After spending so much time coloring, I wasn’t about to let any part of it go to waste! I filled in the bouquet, helping to slightly alter the shape of the bouquet so that it curved around the edge of the greeting. The final touch was to add some Midnight Blue Nuvo drops. Hello crafty friends! Yes, I'm still alive! I've taken a little hiatus from social media, I know. Not planned at all, but you know, life. Sometimes other priorities take center stage. But, I've still been here and still doing my thing in the background. Our next release of new products will be coming at the end of August. I have a few more things that, again, took priority. But once those are complete, I'll be back in the saddle fully. In the meantime, I have a couple of cards to share with you. I have shared these previously on Instagram, so if you follow us there, that's why they may look familiar. 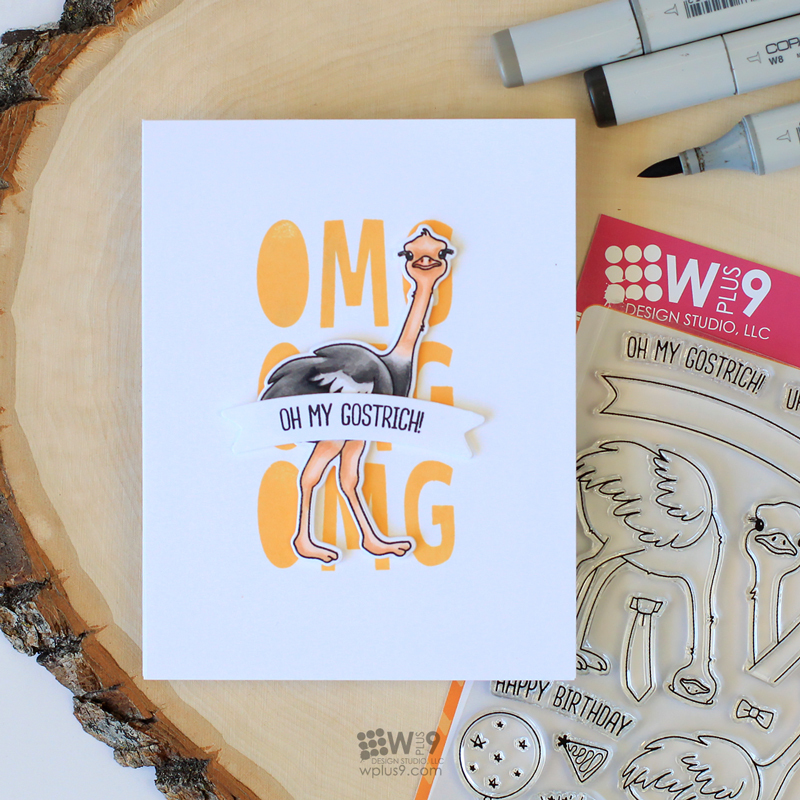 If you have been on the fence about these little cuties from "Oh My Gostrich! ", well, these might push you over the edge. Sorry. My absolute favorite use for this set is for masculine cards. Now it can be used for women or men, but I love that it's not girly or frilly, but also not the stereotypical "fish, tools, barbecue" motifs either. It's still fun. 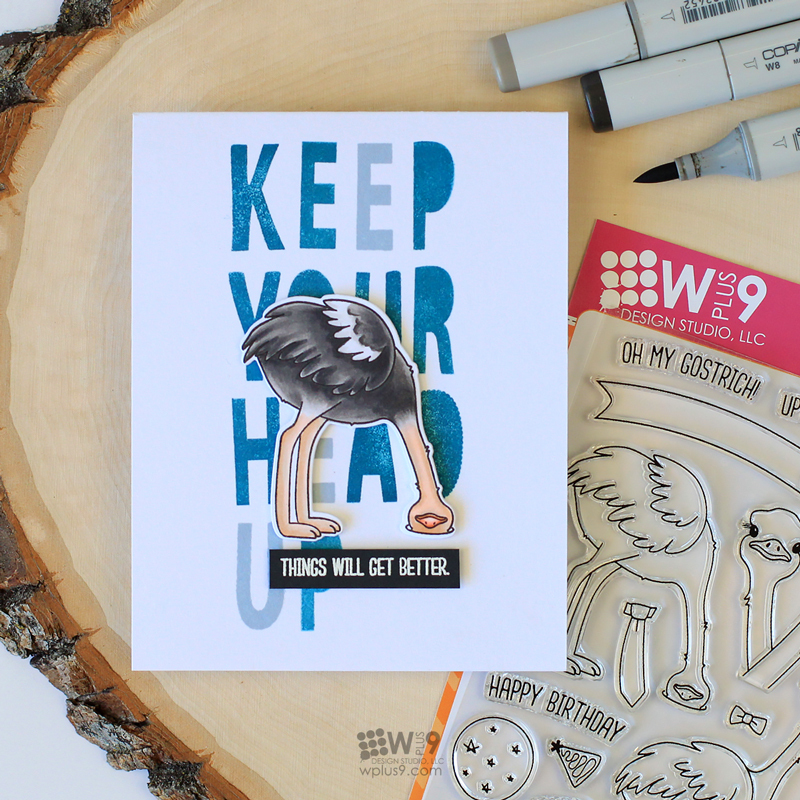 I chose to pair it up with our Whimsy Alpha stamp set just to reinforce the quirkiness of it. And I kept the layout and design quite clean and simple. I stamped "OMG" three times in a vertical stack using Whimsy Alpha in our Wild Mango ink. Using Copics, I colored and then die cut a male ostrich (let's face it, the male ostrich is so much prettier than the female ostrich) to pop up with foam tape right on top. 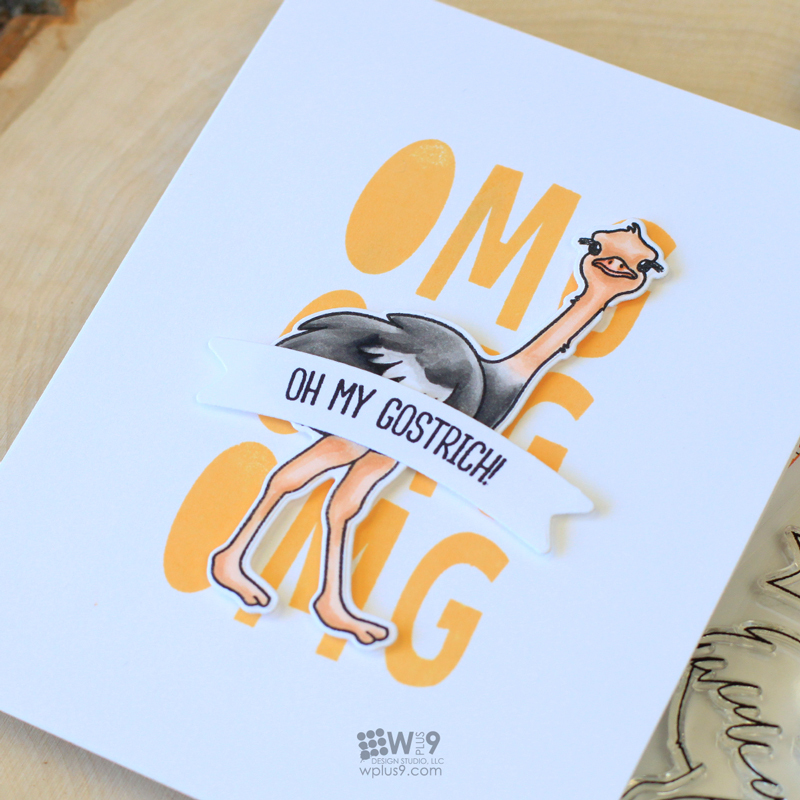 I added a banner from the Oh My Gostrich! Die and then stamped the sentiment to tie the background in with the sentiment. I left the inside blank so that I could fill it in when needed. (if it ever makes it to the mail box! haha) But there are a few sentiments included in the set the would complete the card and be suitable for many occasions, from birthday to encouragement. I really loved this design, so I created another with a longer message for the background. I arranged the letters on my MISTI to spell out "Keep Your Head Up". Any where I did not have enough of a duplicate letter, I just left the space open so that I could come back and add it after my initial stamping. I inked and then stamped all of my letters at once in Falling For Blue ink. I then came back in and stamped the missing letters in Silving Lining using an acrylic block. I did purposely leave out the "U" in the first pass so that I could balance out the design and stamp it in using Silver Lining as well. 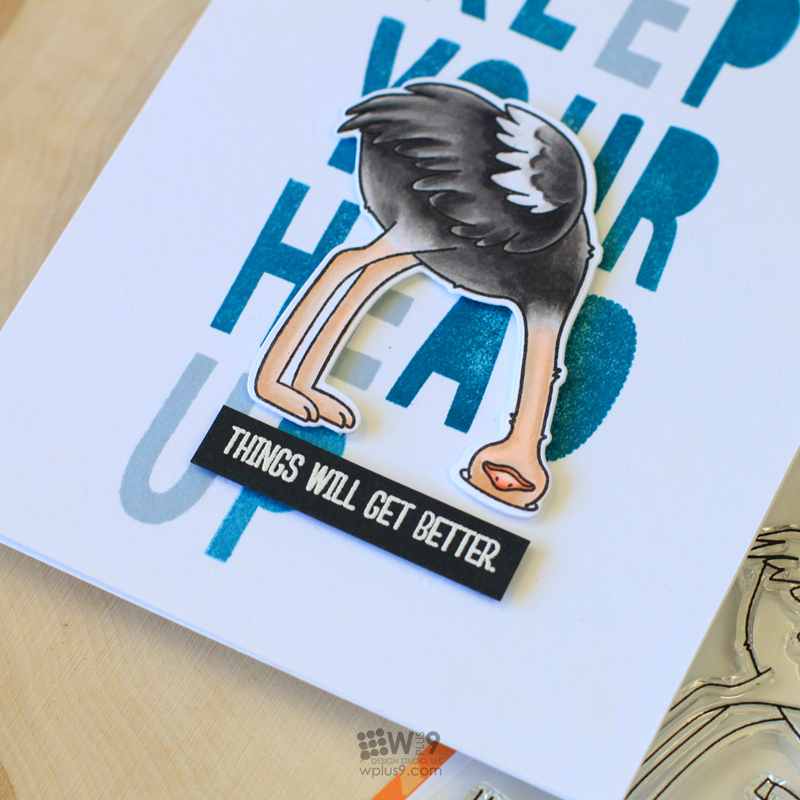 Same as before, I colored and die cut another ostrich and then popped him up over the background sentiment. Before adhering him, I stamped and heat embossed my smaller "Things will get better" sentiment onto black cardstock and trimmed it down. I played around with the placement of both before committing to ensure that the sentiment underneath would still be legible even though portions where covered. That's it for today. I hope that you enjoyed todays project! This really is one of my new favorite designs. If you don't have these exact sets, you could always play around with large alphabet stamps and different sets you may already own to create something similar. Thanks for stopping by, I hope your week is off to a fantastic start! Hello! 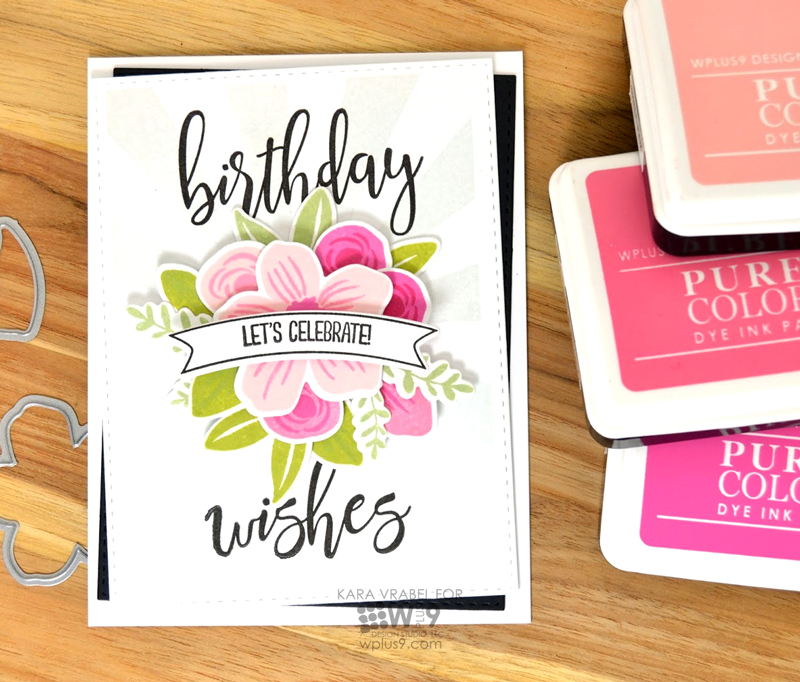 It's Kara and I'm back to share a birthday card with you that mixes some classic WPlus9 stamp sets with some that have been newly released. They work together beautifully. 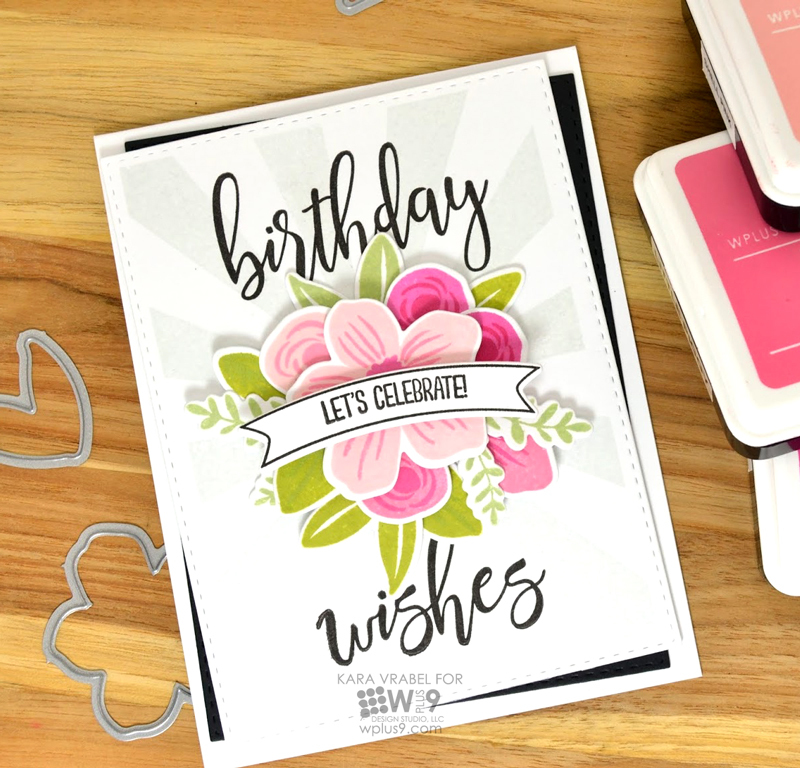 The Birthday Wishes font is really timeless and works with so many design styles. I chose to mix it with the beautiful flowers from Southern Summer Florals. I started by stamping the Big Top Background in Fairy Dust dye ink to create subtle interest and movement behind my focal point. I clustered my flowers and leaves in the center of the card front. The rays seem to be radiating out from behind. The flowers have been stamped in various shades of pink including Shell Pink, Little Piggy, V.I.Pink and Sweet Gelato. For the leaves I used Mojito and Last Leaf. On top of my floral bouquet I added a banner from Oh My Gostrich! stamped with a sentiment from And Many More. 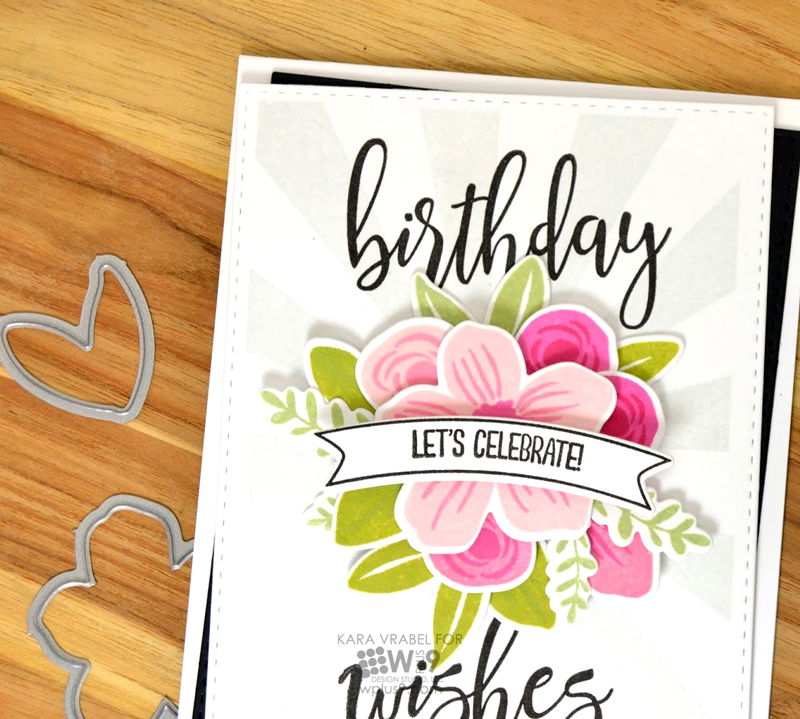 A simple, but beautiful floral birthday card. Thanks for stopping by!